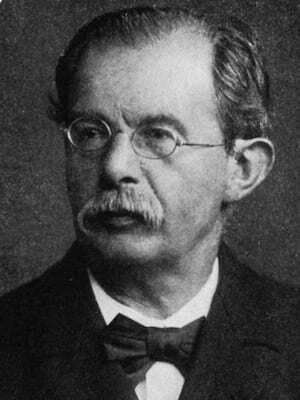 Friedrich Daniel von Recklinghausen (1833 – 1910) was a German pathologist. von Recklinghausen studied pathology under Rudolf Virchow and provided important early descriptions of clinical conditions including haemochromatosis; bone lesions in hyperparathyroidism; and spina bifida. Eponymously affiliated with von Recklinghausen disease (neurofibromatosis NF-1); von Recklinghausen tumor (adenoleiomyofibroma); and von Recklinghausen canals (lymphatic canaliculi). Engel-von Recklinghausen syndrome (1864, 1889) [archaic]. Bone disorder with skeletal deformation seen in advanced hyperparathyroidism. Presence of ‘brown tumours’ deeply pigmented foci consisting of fibrous scarring of the bone with pseudocysts, haemorrhages, and collection of osteoclasts. Commonly presents with fractures, bowing of long bones and often gross deformities of the spine and chest. von Recklinhausen tumour (1896) adenoleiomyofibroma on wall of the posterior uterine wall. Recklinghausen F. Untersuchungen über Rachitis und Osteomalacie. Fischer. 1910.